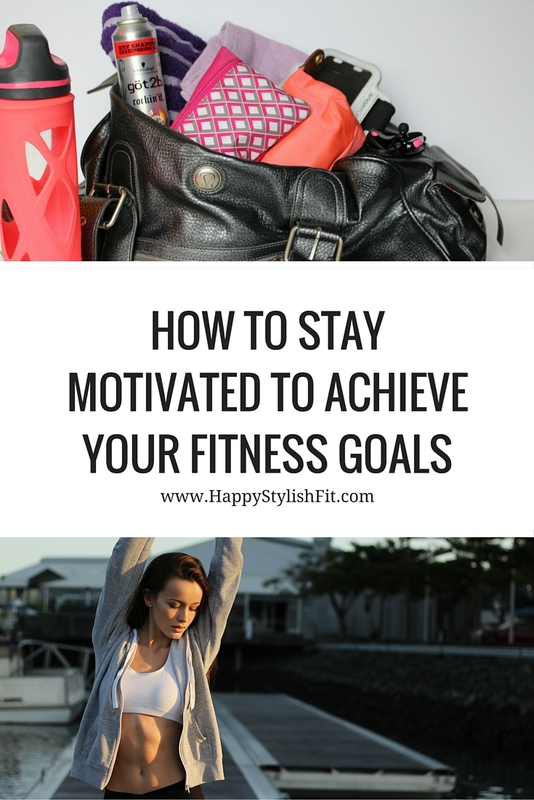 We all know it can be a struggle to stay motivated to achieve our fitness goals. I try to make things as simple as possible, and as visible as possible, to make it as easy as I can to stick to my goals. We can all slip up a bit and miss some workouts, or binge eat over an entire weekend, but the important thing is to not beat yourself up about it, remind yourself why you have your goals, and keep pushing forward to achieve them. 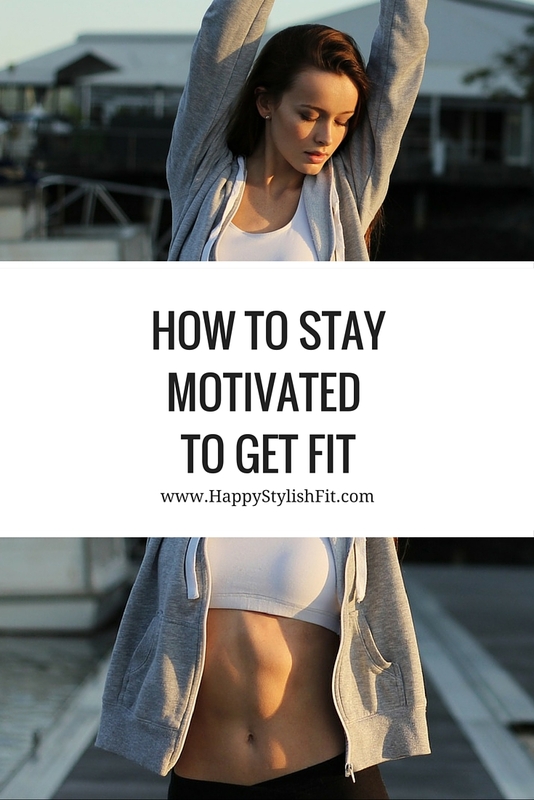 Below are some ideas of how to stay motivated to stay fit. Leave yourself reminders to help motivate you. There’s many different ways you can choose to remind yourself, the main thing to keep in mind is that you want to make sure it’s somewhere that you’ll see everyday. Leave yourself sticky note reminders. They can be notes, cute pictures, or anything you feel like doing that will help to motivate you. Set something out that will make you think of your goals. 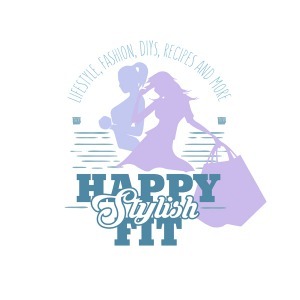 It could be a cute outfit you want to fit just right, your workout clothes right beside your bed, or leave a workout dvd right underneath your tv. Print mantras, or motivational quotes, and post it somewhere. 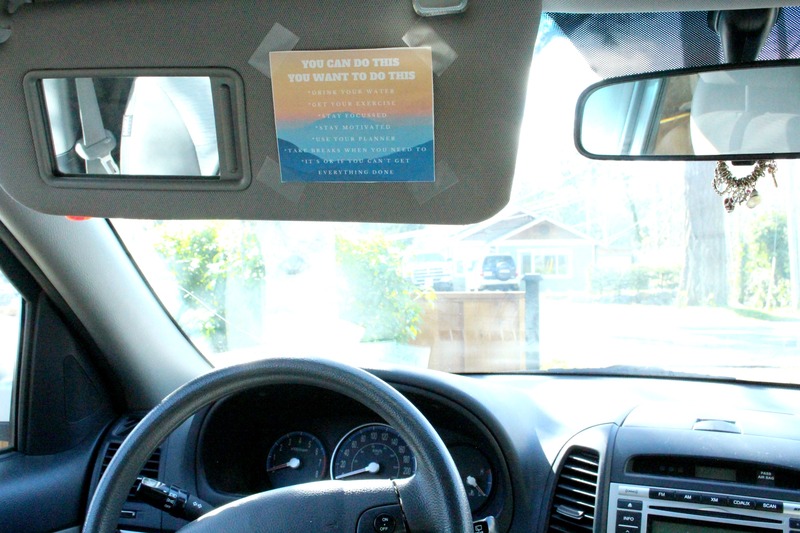 You can get creative – I have a print out I made with Canva on the inside of the visor in my car! 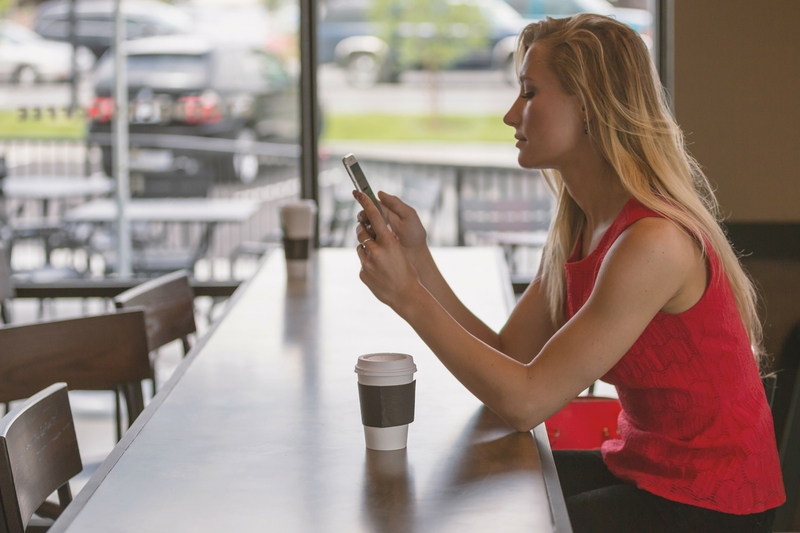 Set reminders in your phone, they can be anything that suits your goal: drink water throughout the day (there’s an app for that), stretch in the morning, eat healthy, inspirational mantras/quotes, and more. Write it down in your planner! Not only is it a reminder, but it helps you plan out your goal(s) and commit to it. It is so important to make sure you move everyday. You feel better, and it really helps to keep you on track. If you don’t have time for a full workout, you can still find time to move for at least 5 minutes. Download the 7 minute workout app I talk about in my 6 Fitness Apps post. Available on Android and ios. Do some basic workout moves while watching tv like squats, lunges, and push-ups. Do a few basic workout moves immediately before you hop in the shower. Do some squats while you’re brushing your teeth. Do some walking lunges while you are moving from room to room in your house. Try to make it a routine by establishing a pattern. As you start to repeat it day after day it becomes more and more automatic until it becomes a habit. Set your workout clothes somewhere you will see them in the morning, workout, and have a smoothie. Pack your gym bag at night, go straight to the gym after work then have dinner. Find out what I keep packed in my gym bag. Every Saturday go for a hike after a yummy breakfast. Have a tv workout when a show you like to watch is on, have a favourite snack once your done. I don’t know if you noticed, but all of these routines have some sort of reward tied to them. A special treat can be a big motivator, and is a good way to establish a habit. It can be as simple, or as big as you’d like. Having another person to check in with and chat about your progress can be a big fitness motivator. It doesn’t necessarily have to be someone you know personally, but someone you can relate to who understands your goals. Check in with a friend on a weekly basis. Find a friend through social media. There’s FB groups, or you can reach out to people on Instagram or your other favourite social media channels. Go to local fitness classes. I hope some of those ideas help you to stay motivated to achieve your goals. 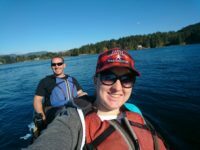 I’d love to hear about your goals, or ways you try to stay motivated. Please leave me a comment below, or reach out to me on social media. It got me making new motivational posters for myself. Thanks Jannine! I’m so glad you enjoyed it and I could help to motivate you!